Students formed teams of 4 or 5 (the free version of GooseChase only allows for 5 teams - make sure you get an educator account, or you can only have 3 teams). You as the teacher need to name the teams ahead of time, and then each team will login with one iPad (with the GooseChase app) and randomly be assigned a team. Then they were set off to look through the books and work on the missions. As the students complete the missions, they pop up on my activity feed. If for some reason I don't like one, I can delete it, and if I really like one, I can award it bonus points. At the end of class, we took a few minutes to go through the activity feed and decide if we agreed with each submission. 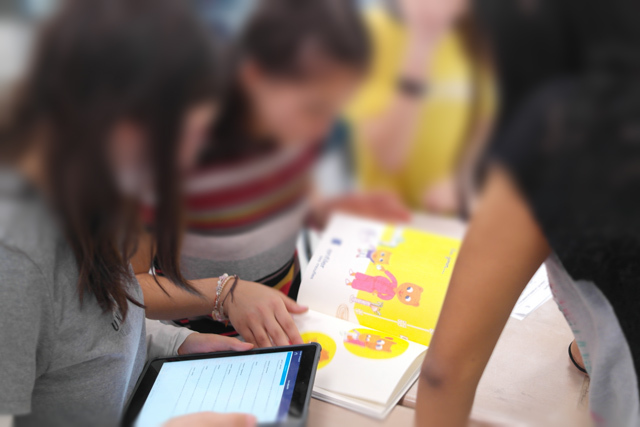 I guess my one complaint about GooseChase, is that if a team used an iPad that had been used in a previous class, they had to go in and delete all their submissions before they could begin. It doesn't seem to clear. 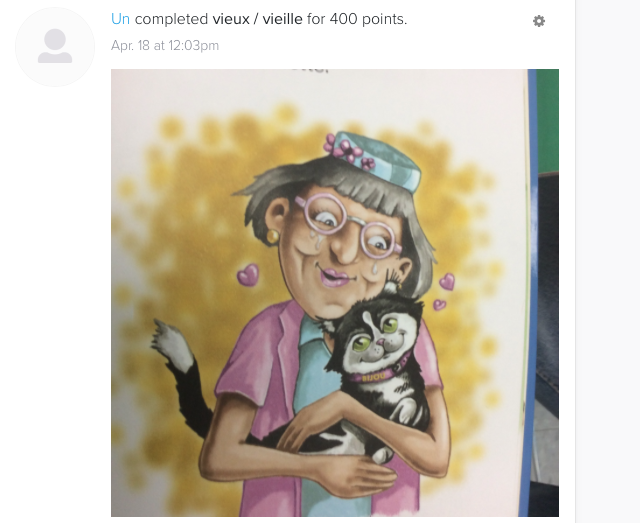 Does anyone else use GooseChase and know a fix for this? 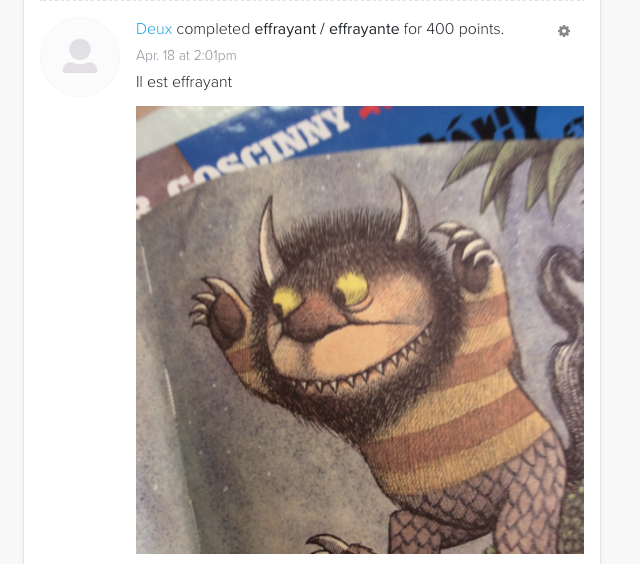 I used this activity the day before April break, and I think it worked well for that. It was high energy, students were out of their seats collaborating, but it also wasn't something that students who left early for break will be behind from missing. 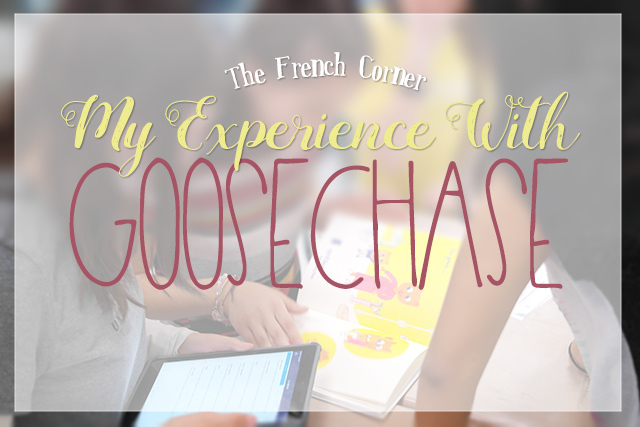 Have you ever used GooseChase? What are your thoughts? In a rut and not sure what to do with a new group of vocabulary words you've been working with? 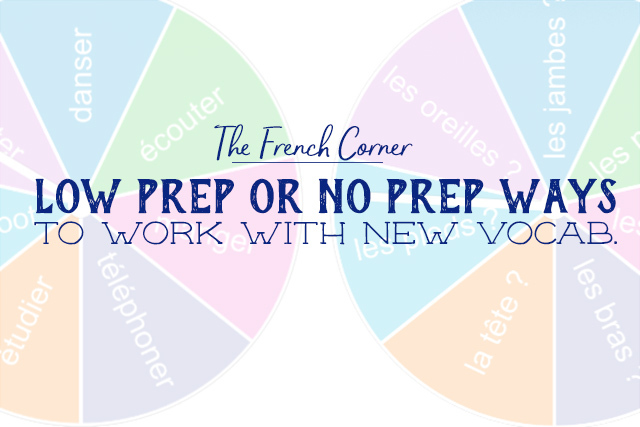 In this post I'll share some low prep and no prep activities you can use, all of which promote 100% target language use. 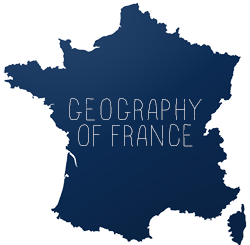 Logique ou pas logique ? 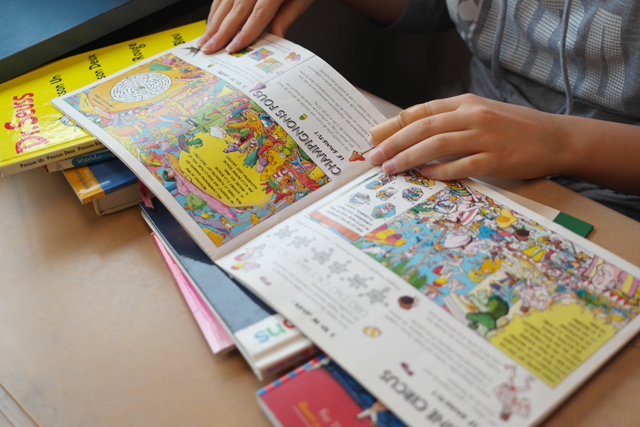 I think I first got the idea of comparing items and decided if they were logical or illogical from Susan Frost, a French teacher at Lake George Junior-Senior High School in Lake George, NY. For this activity, I use SMART Board spinners, but back in the day, I would use those magnetic spinners that you can put on your chalk board. You basically take two groups of vocabulary and spin the spinners to see if the two items make sense together. This one compares activities with parts of the body. It's actually funnier if the answer is not logical, for example, dancing with your ears?! 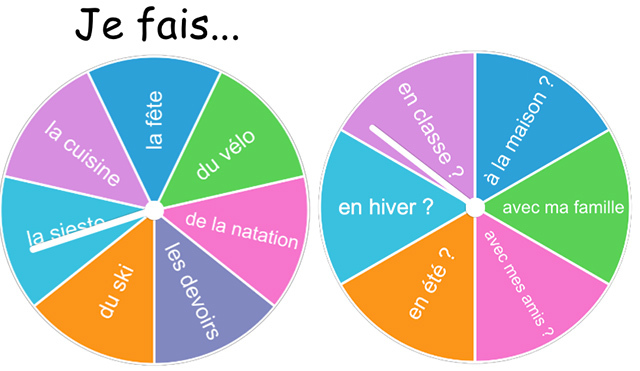 This one compares activities that begin with "Je fais" with various times or places they might be done. Spinners can also be used with numbers to produce math problems in any of the four functions! 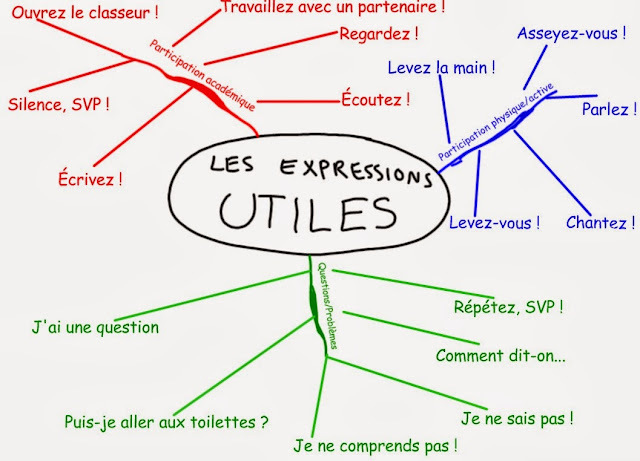 A great way to get students thinking about vocabulary is to organize it into categories, and probably the most visually engaging way to do that is with a mind map. I first blogged about this here. I give my students a set of words to work with and draw a mind map with 3-4 categories for them to copy and expand on, then I have them work in groups to negotiate where they think each term should go. They are expected to speak only in French while they do this. 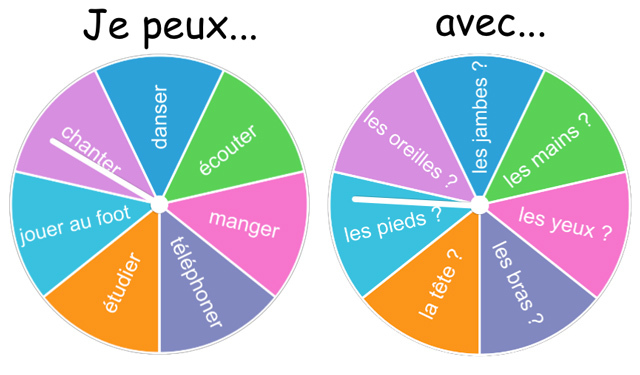 If you're a French teacher, you're probably familiar with LOTO, the French version of Bingo. Instead of a 5x5 board, it's a 4x4. Now you can make your own Loto cards for your students if you're so inclined, but I have my students make their own. 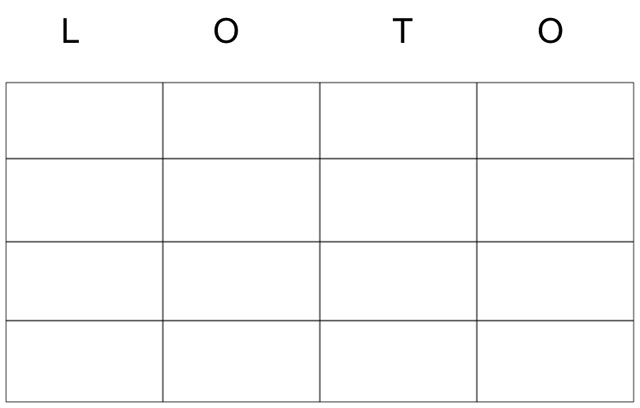 They copy down the Loto board, then they put 16 expressions in the squares. I then act out the terms that the students must look for on their board so as to keep in the target language. 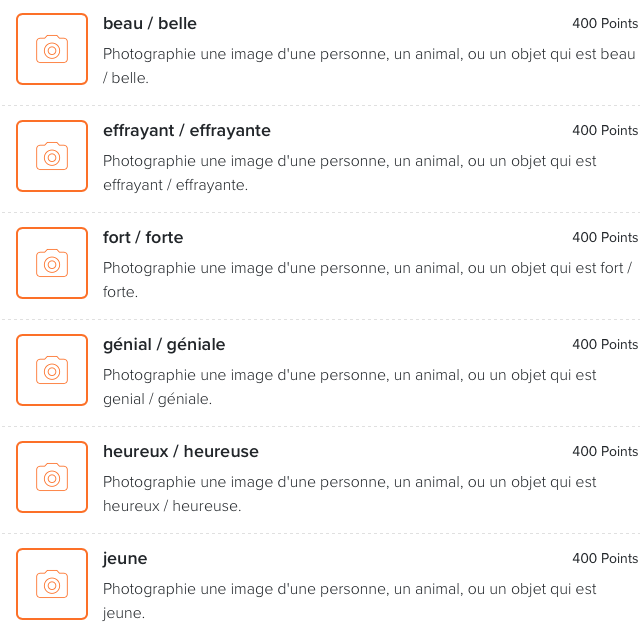 Loto works great for numbers, which, of course, I call out in French because you can't act out numbers really. There are a couple of old standards that I think are worth mentioning. Jacques a dit, or Simon Says, is a great way to get students out of their seats. Mix it up by having a student be Jacques/Simon. Charades or Pictionary (basically the same game but written vs. spoken) is another favorite of mine. There are so many different ways to play it. 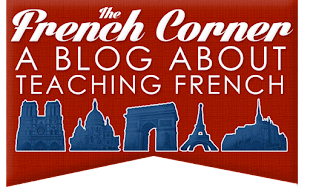 Often if I just have a few minutes left of class I will draw or act out an expression and have students tell me what it is in French. Other times I will have students race to play charades in a group and the group that gets through all the expressions first is the winner. Kids love to draw, so having them draw pictures for each other and guess what term they are drawing is always a fun activity. What are some of your no prep or low prep ways to work with new vocabulary?